A desire to invite stillness, contemplation and reflection in everyday life, is how Linda Espie would describe her point of view as a photographer. Her latest exhibition seeks to do just that – to create space for people to find the extraordinary in the ordinary. Every pilgrimage is a trek from our civilised identity to a landscape that is something other, something personal, the mystery of trekking around the soul. Bruce Davis. While Linda hasn’t trained formally as a photographer, she says she has a “pretty good natural eye”, and it was a personal interest that gradually developed over the past 15 years. As a counsellor, art therapist and published author, Linda works four days a week for an agency and in her own private clinical practice in Melbourne, and looks for a photography project each year to further explore her creative expression and to offer something back to the communities she works alongside as a photographer. Linda has worked for many Catholic organisations over the years, including setting up a new program to support families after suicide at Jesuit Social Services, and at Outreach Grief Services, which was funded by St Vincent’s and Mercy Private Hospital’s in Melbourne. Linda says she has been influenced by her colleagues in Catholic organisations, which has led to an interest in capturing religious organisations and communities in her photographic work. His photography “spoke profoundly” to Linda about “quiet, calm and peace” and she raised the money to bring his exhibition, “A Hidden Wholeness: The Zen Photography of Thomas Merton” to Australia. The exhibition was curated from works at the Thomas Merton Centre, Bellamine University in Louisville, Kentucky. 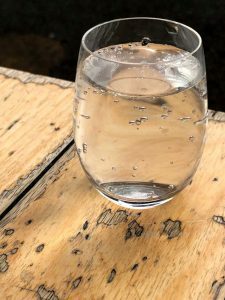 “I was drawn to Merton describing photography as ‘the other music beyond words’ and I felt called to share his works for others to witness and experience,” she says. Mandolin. 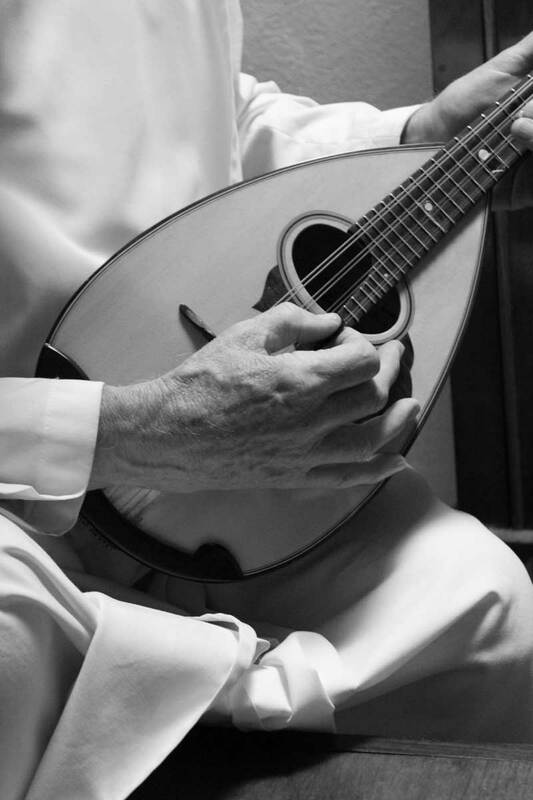 “As a boy, I always wanted to play banjo or guitar, but I settled on the Italian classical mandolin”. Photo of one of the Monks from New Norcia WA. Photo: Linda Espie. 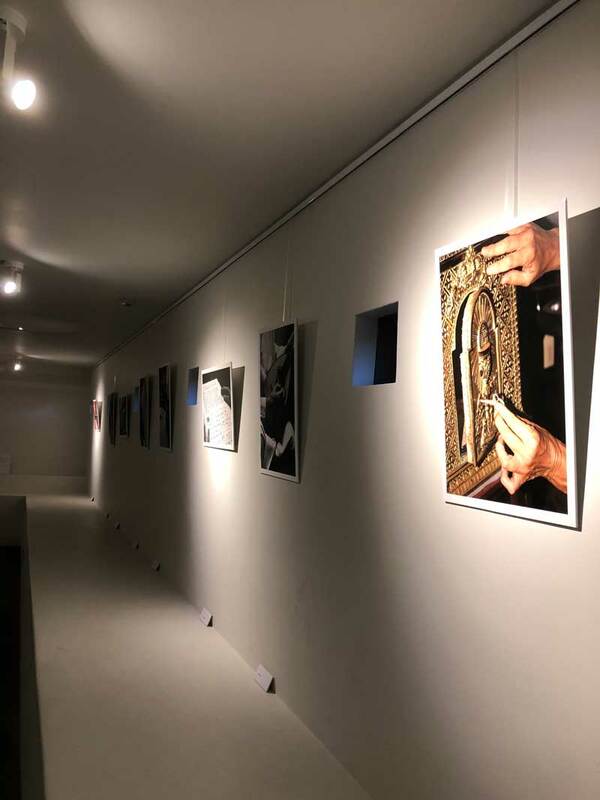 Her most recent exhibition in 2016, “In the Spirit of Hands” held at the Australian Catholic University Gallery in Melbourne was a collection of 35 photographs taken of the monks and staff from New Norcia, Western Australia over the course of one week. The photographs captured the hands of the monks and staff with an object they chose which was meaningful to them such as a mandolin, or a symbol of their work and mission. The exhibition followed on from her earlier collection of works capturing the hands of 30 staff members’ hands, including pastoral workers at St Vincent’s Hospital as an artist in residence in 2011, which she applied for to help develop her work as a photographer. “Working as an artist in residence at St Vincent’s was an incredible opportunity to delve into the personal and professional stories of the staff working in the hospital and to discover who they are as people. She was interested in why they do what they do, what the work means to them and importantly, how do they sustain and maintain themselves in their caring roles – which requires deep commitment” reflects Linda. Over 12 months, Linda sat with staff and photographed their hands with an object that represented their work or mission, such as a bible at a pulpit or a test tube and asked them to talk about why the object was important to them. Over the course of the year, Linda took 3,000 photographs with only 17 displayed in her first exhibition, “The Voice of Hands: St Vincent’s Staff Speak in Action”. The exhibition was nominated for an award within the St Vincent’s Health Australia Quality Awards 2012 and was one of three finalists in the Mary Aikenhead Ministries Award. While her work was primarily focused on staff, she did capture the hands of one palliative care resident and his wife who was holding his hands. Stillness. What emerges when you are still? Photo from “Pondering Grief” 2018. Photo: Linda Espie. Linda has spent countless hours working with the dying and their loved ones as they deal with the grief and trauma of loss, both in her work in palliative care and as a counsellor. Her fourth published book, Pondering Grief is a collection of images and words about loss, grief, change and transition. Linda says she wanted to write this book to provide readers with a space for cultivating personal reflection. 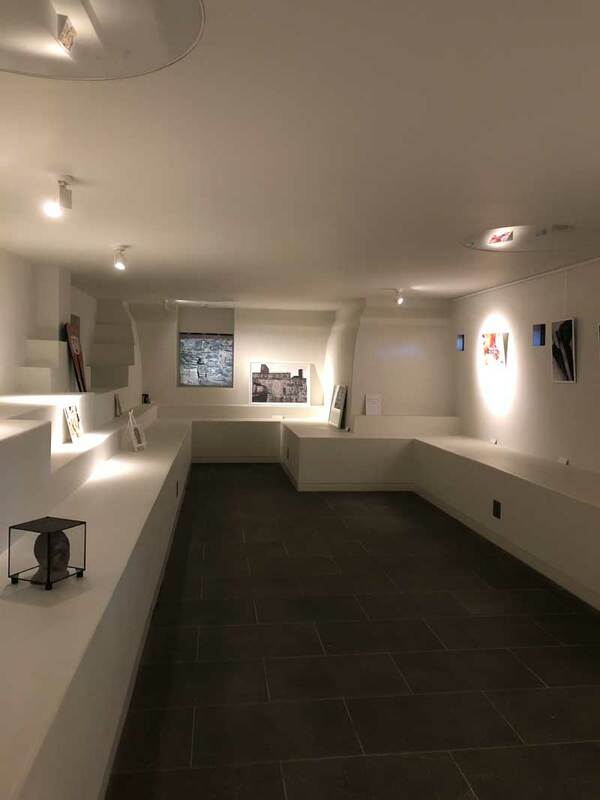 Linda’s new exhibition, “A Different Kind of Pilgrimage: Inner Noticing”, comprises a selection of photographs from Pondering Grief, images and stories from her series of the monks and staff at New Norcia, as well as some recent photographs taken in New York. She hopes to continue to do more photographic projects along these lines in the future and is on the look out for a new project, perhaps with another religious community overseas. “Religious communities have such rich traditions and I would love to capture the stories of a contemplative order of religious women to build upon my work,” says Linda. St Heliers Street, Abbotsford, Victoria. Annette Loughlin-Smith has worked in communications and the media for Catholic education and other organisations. 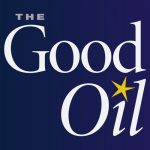 Annette is a guest editor for "The Good Oil".